Can launch a raft here but there is no boat ramp. Mainly used by small watercraft running the Green River Daily. From the town of Green River take the road just east of the river and follow it past swaseys beach to the put-in. From swasey's beach the road is all dirt. Most cars can make it but high clearance is a plus. Read and run. Best wave trains are on river left. Right after the tusher dam, there are some riffles. 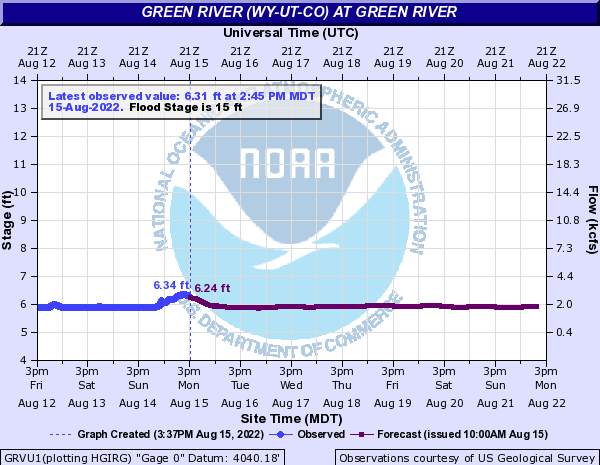 This is the last action you will see for a long time on the green river. A nice camp on river left that has fire pits and picnic tables. Good access to the camp from the river on the very large recirculating eddy on river left. Can be crowded and noisy on the weekends. Pretty quiet during the week though. A nice beach and campsite exists on river left next to the take out. This is a BLM campground and is currently free. Brown Trout have a yellowish belly, with black and red spots on the sides. This fish is a fresh, coldwater fish and is found all over.